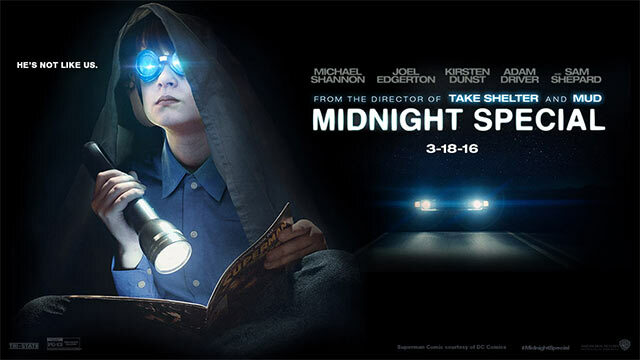 Midnight Special is the kind of movie that forced me into battle myself in some way. To clarify: it's one I readily admit (after only one watch) that I admire more than I love, if that makes sense. I went in on the promise of a Spielberg-esque sci-fi chase film. It pulls, quite obviously, from Close Encounters of the Third Kind, even quite well at times. But what I ended up with was a film that doesn't reach the emotional high of its predecessor. It's missing the connections that Spielberg so perfectly offers in the end. 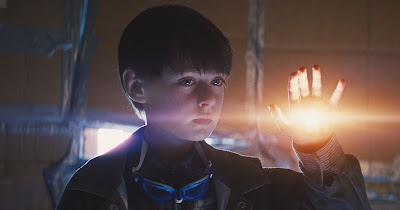 Midnight Special offers an answer to the biggest question (and not much else), but it's an ending that didn't fully work for me, and the things I really wanted more of were left by the wayside. In a way, that's all good and well. This is a Jeff Nichols film. I know that. This in spite of the fact that (I know...I know!) I have never seen any of his previous work. More than anything, Midnight Special has me wanting to go back and check said previous work out. This is a film made by a guy who clearly knows how to move a story forward with a camera. It opens in a cheap motel room where two men watch a news report on the kidnapping of a young boy from a cultish religious group in Texas. That very young boy sits in the floor between the two beds, wearing goggles, reading a Superman comic. Nothing is revealed. Everything is pure mystery. No headlights on a dark Texas highway in the darkness of the early morning. Then, the chase begins, and it never lets up. The opening sequence of this film is a full-on delight of darkness and light. 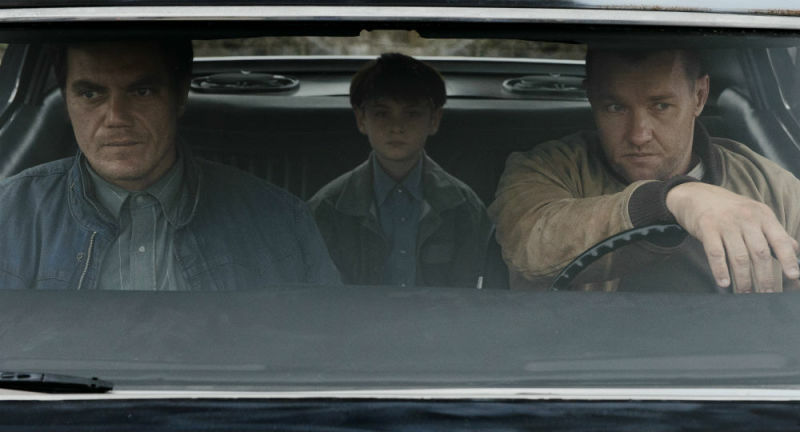 The two men in the motel room are Roy (Michael Shannon), who we quickly learn to be the boy's father, and Lucas (Joel Edgerton), a man enlisted by Roy as protector. They drive fast in their throaty, primer-coated muscle car. 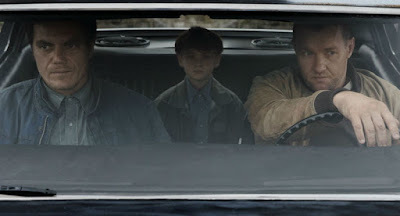 The boy, Alton (Jaeden Lieberher), sits in the back, calm and comfortable. A near accident, a State Trooper is shot, and from there it's one thing after another. One of those things is the takedown of a compound in Texas led by Calvin Meyer (Sam Shepard), a man convinced that the young Alton, who he has raised as his own for the past few years, is indeed special, a mystery that we know going in but that surprises with each new development. The boy, it seems, is the cult's entire purpose. He is who gives them their message. His disciples are bussed into an FBI interrogation, led by Sevier (Adam Driver), brought in by the NSA to figure out what exactly this boy is. Then, there's the boy's mother Sarah (Kirsten Dunst), who years earlier left the cult and now must come on as another protector to her son, kept from her in the wake of the Reverend Calvin's takeover. Dunst does great work in a role that isn't given very much in the way of backstory, where I would argue some is needed. Alton's abilities, even those he doesn't understand, come through. He can pick up radio frequencies and busts out in Spanish language talk radio minutes before the station runs the same phrases. In the day time, his eyes emit a powerful bright light that when penetrating another person create a sensation of other-worldly experience or truth or some other revelation about what this life may really be. And it remains a mystery throughout...something I much love in my science fiction. Director Nichols, in a recent interview with The Verve, has stated that "plot is very overrated." I'm fine with that statement, but what he ends up doing with the end of the film takes away from the beautifully realized developments that came before. As I alluded to before, it actually gives too much of an answer to only one of the many questions, and it's one that doesn't make much sense to me. But the experience of watching this film, despite that, is worth every single minute. It's a large scale film that plays small. I like that. It features performances from Michael Shannon, Joel Edgerton, and Adam Driver that are undeniable in how perfectly in tune they are with Nichols' vision. And that vision is shot with absolute wonder and imagination by Nichols and his cinematographer, Adam Stone. I'm writing this review three weeks after finally seeing this film. And that after a four weeks of waiting for this thing to finally show up at my local multiplex, where it vanished after one week on one screen in a city of 800,000 people. WTF? Here is a film that satisfies, even if it doesn't quite nail it in the end. It's a solid mainstream-ish entertainment pronounced dead on arrival in the dying muck of the pre-summer multiplex, where on the day I saw it, people were out in droves to throw their hard-earned money at God's Not Dead 2. I'd wager that Midnight Special is still better than 99% of the movies out even right now. And it is just straight gone from view. I'd say see this on the hugest screen you can find. Alas, that probably won't ever happen. I really hope my theater gets this, I've wanted to see it since it premiered at Sundance, and I was extra bummed it didn't come out last year like it was supposed to. It literally lasted a week here. I consider myself lucky. Hope you get, or got, to see it. I really liked this though I cant say I loved it. Had some iffy elements and doesnt nearly measure up to the brilliance of Take Shelter. I hear that, and I agree that Take Shelter is the stronger movie. Great point about admiring the film. I especially admired the actors involved; all brought solid A-game to this movie. I really wanted to see this when it was in theaters around here, but at the time it was out, I had almost absolutely no time to go to the movie theater, as I was busy with a play, & then I got laryngitis. By the time I had time to see it, it was gone from theaters. I've heard really good things about the director of this film, Jeff Nichols, especially his two prior films, Take Shelter, & Mud. I'll have to pick those up soon, & I'll get Midnight Special when it comes out on Blu-ray. It came and went fast.